Basilosaurus ("king lizard") is a genus of prehistoric cetacean that existed during the Late Eocene, 40 to 35 million years ago (mya). The first fossil of B. cetoides was discovered in the United States and was initially believed to be some sort of reptile, hence the suffix -saurus, but it was later found to be a marine mammal. Richard Owen wished to rename the creature Zeuglodon ("yoked tooth"), but, per taxonomic rules, the creature's first name remained permanent. Fossils of B. isis have been found in Egypt and Jordan. The species B. cetoides is the state fossil of Mississippi and Alabama. Measuring 15–18 m (49–59 ft), Basilosaurus cetoides is one of the largest-known animals to exist from K-Pg extinction event 66 million years ago (mya) to around 15 million years ago when modern cetaceans began to reach enormous sizes. B. isis is slightly smaller than B. cetoides. A 16-meter (52 ft) individual of B. isis had 35-centimeter-long (14 in) hind limbs with fused tarsals and only three digits. The limited size of the limb and the absence of an articulation with the sacral vertebrae, makes a locomotory function unlikely. Analysis has shown that the reduced limbs could rapidly adduct between only two positions. Basilosaurus has an anguilliform (eel-like) body shape because of the elongation of the centra of the thoracic through anterior caudal vertebrae. In life, these vertebrae were filled with marrow, and because of the enlarged size, made them buoyant. Basilosaurus probably swam predominantly in two dimensions at the sea surface, in contrast to the smaller Dorudon, which was likely a diving, three-dimensional swimmer. The skeletal anatomy of the tail suggests that a small fluke was probably present, which would have aided only vertical motion. Most reconstructions show a small, speculative dorsal fin similar to a rorqual's, but other reconstructions show a dorsal ridge. Similarly sized thoracic, lumbar, sacral, and caudal vertebrae imply that it moved in an anguilliform fashion, but predominantly in the vertical plane. Paleontologist Philip D. Gingerich theorized that Basilosaurus may also have moved in a very odd, horizontal anguilliform fashion to some degree, something completely unknown in modern cetaceans. The vertebrae appear to have been hollow, and likely also fluid-filled. This would imply that Basilosaurus typically functioned in only two dimensions at the ocean surface, compared with the three-dimensional habits of most other cetaceans. Judging from the relatively weak axial musculature and the thick bones in the limbs, Basilosaurus is not believed to have been capable of sustained swimming or deep diving, or terrestrial locomotion. The cheek teeth of Basilosaurus retain a complex morphology and functional occlusion. Heavy wear on the teeth reveals that food was first chewed then swallowed. Scientists were able to estimate the bite force of Basilosaurus by analyzing the scarred skull bones of another species of prehistoric whale, Dorudon, and concluded they could bite with a force of 3,600 pounds per square inch (25,000 kPa). Analyses of the stomach contents of B. cetoides has shown that this species fed exclusively on fish and sharks, while bite marks on the skulls of juvenile Dorudon have been matched with the dentition of B. isis, suggesting a dietary difference between the two species, similar to that found in different populations of modern killer whales. It was probably an active predator rather than a scavenger. The discovery of juvenile Dorudon at Wadi Al Hitan bearing distinctive bite marks on their skulls indicates that B. isis would have aimed for the skulls of its victims to kill its prey, then subsequently tore its meals apart, based on the disarticulated remains of the Dorudon skeletons. The finding further cements theories that B. isis was an apex predator that may have hunted newborn and juvenile Dorudon at Wadi Al Hitan when mothers of the latter came to give birth. 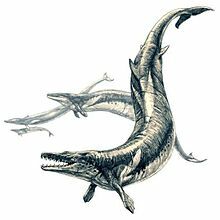 The two species of Basilosaurus are B. cetoides, whose remains were discovered in the United States, and B. isis, which was discovered in Egypt. B. cetoides is the type species for the genus. During the early 19th century, B. cetoides fossils were so common (and sufficiently large) that they were regularly used as furniture in the American South. Vertebrae were sent to the American Philosophical Society by a Judge Bry of Arkansas and Judge John Creagh of Clarke County, Alabama. Both fossils ended up in the hands of the anatomist Richard Harlan, who requested more examples from Creagh. The first bones were unearthed when rain caused a hillside full of sea shells to slide. The bones were lying in a curved line "measuring upwards of four hundred feet in length, with intervals which were vacant." Many of these bones were used as andirons and destroyed; Bry saved the bones he could find, but was convinced more bones were still to be found on the location. Bry speculated that the bones must have belonged to a "sea monster" and supplied "a piece having the appearance of a tooth" to help determine which kind. Harlan identified the tooth as a wedge-shaped shell and instead focused on "a vertebra of enormous dimensions" which he assumed belonged to the order "Enalio-Sauri of Conybeare", "found only in the sub-cretaceous series." He noted that some parts of the vertebra were similar to those of Plesiosaurus, but that they were completely different in proportions. Comparing his vertebra to those of large dinosaurs such as Megalosaurus and Iguanodon, Harlan concluded that his specimen was considerably larger—he estimated the animal to have been no less than 80–100 ft (24–30 m) long—and therefore suggested the name Basilosaurus, meaning “king lizard”. Harlan brought his assembled specimens (including fragments of jaw and teeth, humerus, and rib fragments) to the UK where he presented them to anatomist Richard Owen. Owen concluded that the molar teeth were two-rooted, a dental morphology unknown in fishes and reptiles, and more complex and varied than in any known reptile, and therefore that the specimen must be a mammal. Owen correctly associated the teeth with cetaceans, but he thought it was an herbivorous animal, similar to sirenians. Consequently, Owen proposed renaming the find Zeuglodon cetoides (“whale-like yoke teeth” in reference to the double-rooted teeth) and Harlan agreed. Zeuglodon, now a junior synonym, is considered by many to be a more fitting name, but the first-published name always takes precedence. Wadi El Hitan, otherwise known as Whale Valley, is an Egyptian sandstone formation where many early-whale skeletons were discovered. 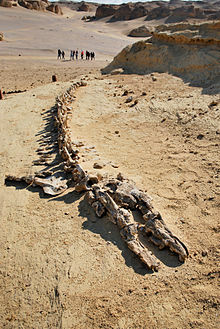 German botanist Georg August Schweinfurth discovered the first archaeocete whale in Egypt (Zeuglodon osiris, now Saghacetus osiris) in 1879. He visited the Qasr el Sagha Formation in 1884 and 1886 and missed the now famous Wadi El Hitan by a few kilometers. German paleontologist Wilhelm Barnim Dames described the material, including the type specimen of Z. osiris, a well-preserved dentary. Hugh Beadnell, head of the Geological Survey of Egypt 1896–1906, named and described Zeuglodon isis in Andrews 1904 based on a partial mandible and several vertebrae from Wadi El Hitan in Egypt. Andrews 1906 described a skull and some vertebrae of a smaller archaeocete and named it Prozeuglodon atrox, now known today as Dorudon atrox. Kellogg 1936 discovered deciduous teeth in this skull and it was then believed to be a juvenile [Pro]zeuglodon isis for decades before more complete fossils of mature Dorudon were discovered. In the 1980s, Elwyn L. Simons and Philip D. Gingerich started to excavate at Qasr el-Sagha and Wadi El Hitan with the hope of finding material that could match archaeocete fossils from Pakistan. Since then, over 500 archaeocete skeletons have been found at these two locations, of which most are B. isis or D. atrox, several of the latter carrying bite marks assumed to be from the former. Gingerich, Smith & Simons 1990 described additional fossils including foot bones and speculated that the reduced hind limbs were used as copulatory guides. In 2016, a complete skeleton, the first-ever found for Basilosaurus, was uncovered in Wadi El Hitan, preserved with the remains of another whale (which was either a last meal or an unborn fetus) inside its ribcage. This specimen was later found to have eaten Dorudon and several species of fish. The whale's skeleton also shows signs of scavenging or predation by large sharks, among them the otodontid Carcharocles sokolovi, an ancestor to the later C. megalodon. Zeuglodon wanklyni was described in 1876 based on a skull found in the Wanklyn's Barton Cliff in the United Kingdom. This single specimen, however, quickly disappeared and has since been declared a nomen nudum or referred to as Zygorhiza wanklyni. Zeuglodon vredense or vredensis was named in the 19th century based on a single, isolated tooth without any kind of accompanying description, and Kellogg 1936 therefore declared it a nomen nudum. Zeuglodon puschi[i] from Poland was named by Brandt 1873. Kellogg 1936 noted that the species is based on an incomplete vertebra of indeterminable position and, therefore, that the species is invalid. Zeuglodon brachyspondylus was described by Müller 1849 based on some vertebrae from Zeuglodon hydrarchus, better known as Dr Albert Koch's "Hydrarchos". Kellogg 1936, synonymized it with Pontogeneus priscus, which Uhen 2005 declared a nomen dubium. Basilosaurus drazindai was named by Gingerich et al. 1997 based on a single lumbar vertebra. It was later declared a nomen dubium by Uhen (2013), but Gingerich and Zouhri (in press) re-assigned it to Eocetus. Zeuglodon elliotsmithii, Z. sensitivius, Z. sensitivus, and Z. zitteli were synonymized and grouped under the genus Saghacetus by Gingerich 1992. Zeuglodon paulsoni from Ukraine was named by Brandt 1873. It was synonymized with Platyosphys but is now considered nomen dubium. Gingerich and Zouhri (in press), however, maintain Platyosphys as valid. A female Basilosaurus is featured in the second episode of the BBC documentary series Walking with Beasts. ^ "State Symbols". State of Mississippi. Archived from the original on 22 August 2013. Retrieved 24 August 2013. ^ a b Gingerich, Philip D. "Basilosaurus cetoides". Encyclopedia of Alabama. Retrieved 24 August 2013. ^ Houssaye, A; Tafforeau, P; de Muizon, C; Gingerich, PD (2011). "Evolution of Whales from Land to Sea". PLoS ONE. 10 (2): e0118409. doi:10.1371/journal.pone.0118409. PMC 4340927. PMID 25714394. ^ Gingerich, P. D. (2008). "Early Evolution of Whales: A Century of Research in Egypt" (PDF). In Fleagle, J. G.; Gilbert, C. C. Elwyn Simons: A Search for Origins. Developments in Primatology: Progress and Prospects. pp. 107–124. ISBN 978-0-387-73895-6. ^ "Explore Our Collections: Basilosaurus". Smithonian, National Museum of Natural History. Retrieved 24 August 2013. ^ Snively, E.; Fahlke, J. M.; Welsh, R. C. (2015). "Bone-Breaking Bite Force of Basilosaurus isis (Mammalia, Cetacea) from the Late Eocene of Egypt Estimated by Finite Element Analysis". PLoS ONE. 10 (2): e0118380. doi:10.1371/journal.pone.0118380. PMC 4340796. PMID 25714832. ^ Snively, Eric; Fahlke, Julia M.; Welsh, Robert C. (25 February 2015). "Bone-Breaking Bite Force of Basilosaurus isis (Mammalia, Cetacea) from the Late Eocene of Egypt Estimated by Finite Element Analysis". PLOS ONE. 10 (2): e0118380. doi:10.1371/journal.pone.0118380. PMC 4340796. PMID 25714832. ^ "Basilosaurus". BBC Nature. Retrieved 24 August 2013. ^ Switek, Brian (September 21, 2008). "The Legacy of the Basilosaurus". ScienceBlogs. Retrieved 14 September 2013. ^ Brian Switek (December 2010). "How Did Whales Evolve?". Smithsonian. ^ "Wadi Al-Hitan". World Heritage Site. Retrieved 17 August 2017. ^ Griffiths, Sarah (2015-06-04). "Egyptian fossils reveal a whale inside a whale, eaten by a shark | Daily Mail Online". Dailymail.co.uk. Retrieved 2018-06-05. ^ Basilosauridae in the Paleobiology Database: Taxonomic history. Retrieved August 2013. ^ Zeuglodon vredense (nomen nudum) in the Paleobiology Database. Retrieved August 2013. ^ Zeuglodon puschii (nomen dubium) in the Paleobiology Database. Retrieved August 2013. ^ Basilosaurus drazindai in the Paleobiology Database. Retrieved August 2013. ^ a b Gingerich, Philip D.; Zouhri, Samir (2015). "New fauna of archaeocete whales (Mammalia, Cetacea) from the Bartonian middle Eocene of southern Morocco". Journal of African Earth Sciences. 111: 273–286. doi:10.1016/j.jafrearsci.2015.08.006. ^ "Walking with Beasts". BBC. Retrieved 9 December 2018. Andrews, C. W. (1904). "Further notes on the mammals of the Eocene of Egypt. Part III". Geological Magazine. 5. 1 (5): 211–215. doi:10.1017/s0016756800119624. Lay summary. Andrews, C. W. (1906). A descriptive catalogue of the Tertiary Vertebrata of the Fayûm, Egypt. British Museum (Natural History). OCLC 3675777. Bejder, Lars; Hall, Brian K. (2002). "Limbs in whales and limblessness in other vertebrates: mechanisms of evolutionary and developmental transformation and loss" (PDF). Evolution and Development. 4 (6): 445–458. doi:10.1046/j.1525-142x.2002.02033.x. PMID 12492145. Brandt, J. F., von (1873). "Über bisher in Russland gefundene Reste von Zeuglodonten". Mélanges Biologiques Tirés du Bulletin de l'Académie Impériale des Sciences de St. Pétersbourg. 9: 111–112. Lay summary (August 2013). Fahlke, Julia M. (2012). "Bite marks revisited – evidence for middle-to-late Eocene Basilosaurus isis predation on Dorudon atrox (both Cetacea, Basilosauridae)" (PDF). Palaeontologia Electronica. 15 (3). Fahlke, Julia M.; Gingerich, Philip D.; Welsh, Robert C.; Wood, Aaron R. (2011). "Cranial asymmetry in Eocene archaeocete whales and the evolution of directional hearing in water". PNAS. 108 (35): 14545–14548. doi:10.1073/pnas.1108927108. PMC 3167538. PMID 21873217. Gidley, J. W. (1913). "A recently mounted Zeuglodon skeleton in the United States National Museum". Proceedings of the United States National Museum. 44 (1975): 649–654. doi:10.5479/si.00963801.44-1975.649. Gingerich, P. D. (1992). "Marine Mammals (Cetacean and Sirenia) from the Eocene of Gebel Mokattam and Fayum, Egypt: Stratigraphy, Age, and Paleoenvironments". University of Michigan Papers on Paleontology. 30: 1–84. hdl:2027.42/48630. OCLC 26941847. Gingerich, P. D. (1998). "Paleobiological Perspectives on Mesonychia, Archaeoceti, and the Origin of Whales" (PDF). In Thewissen, J. G. M. The Emergence of Whales: Evolutionary Patterns in the Origin of Cetacea. Advances in Vertebrate Paleobiology. 1. Springer. pp. 424–439. ISBN 9780306458538. Gingerich, P. D. (2007). "Early evolution of whales: a century of research in Egypt" (PDF). In Fleagle, J. G.; Gilbert, Christopher C. Elwyn Simons: A Search for Origins. New York: Springer. pp. 107–124. ISBN 978-0-387-73896-3. OCLC 233971398. Gingerich, P. D.; Arif, M; Bhatti, M Akram; Anwar, M; Sanders, William J (1997). "Basilosaurus drazindai and Basiloterus hussaini, New Archaeoceti (Mammalia, Cetacea) from the Middle Eocene Drazinda Formation, with a Revised Interpretation of Ages of Whale-Bearing Strata in the Kirthar Group of the Sulaiman Range, Punjab (Pakistan)". Contributions from the Museum of Paleontology, University of Michigan. 30 (2): 55–81. hdl:2027.42/48652. OCLC 742731913. Gingerich, Philip D.; Smith, B. Holly; Simons, Elwyn L. (1990). "Hind Limbs of Eocene Basilosaurus: Evidence of Feet in Whales". Science. 249 (4965): 154–157. doi:10.1126/science.249.4965.154. PMID 17836967. Gingerich, P. D.; Uhen, Mark D. (1998). "Likelihood estimation of the time of origin of Cetacea and the time of divergence of Cetacea and Artiodactyla" (PDF). Palaeontologia Electronica. 1 (2): 1–45. Gol'din, Pavel; Zvonok, Evgenij (2013). "Basilotritus uheni, a New Cetacean (Cetacea, Basilosauridae) from the Late Middle Eocene of Eastern Europe". Journal of Paleontology. 87 (2): 254–268. doi:10.1666/12-080R.1. Harlan, R. (1834). "Notice of fossil bones found in the Tertiary formation of the State of Louisiana". Transactions of the American Philosophical Society. 4: 397–403. doi:10.2307/1004838. JSTOR 1004838. OCLC 63356837. Kellogg, R. (1923). "Description of two squalodonts recently discovered in the Calvert Cliffs, Maryland; and notes on the shark-toothed cetaceans". Proceedings of the United States National Museum. 62 (2462): 1–69. doi:10.5479/si.00963801.62-2462.1. hdl:10088/15278. OCLC 82628874. Kellogg, R. (1936). A review of the Archaeoceti (PDF, 46 Mb). Washington: Carnegie Institution of Washington. OCLC 681376. Lucas, Frederic A. (1900). "The pelvic girdle of Zeuglodon, Basilosaurus cetoides (Owen) with notes on other portions of the skeleton" (PDF). Proceedings of the United States National Museum. 23 (1211): 327–331. doi:10.5479/si.00963801.23-1211.327. hdl:2027/hvd.32044107351454. OCLC 75278090. Lydekker, R. (1892). "4. On Zeuglodont and other Cetacean Remains from the Tertiary of the Caucasus". Proceedings of the Zoological Society of London. 60 (4): 558–581. doi:10.1111/j.1096-3642.1892.tb01782.x. OCLC 819196877. Lay summary. Müller, Johannes Peter (1849). Über die fossilen Reste der Zeuglodonten von Nordamerika mit Rücksicht auf die europäischen Reste aus dieser Familie. Berlin: Reiner. pp. 1–38. OCLC 422134028. Lay summary. Owen, R. (1839). "Observations on the Basilosaurus of Dr. Harlan (Zeuglodon cetoides, Owen)". Transactions of the Geological Society of London. 6: 69–79. doi:10.1144/transgslb.6.1.69. Lay summary. Racicot, Rachel A.; Berta, Annalisa (2013). "Comparative Morphology of Porpoise (Cetacea: Phocoenidae) Pterygoid Sinuses: Phylogenetic and Functional Implications". Journal of Morphology. 274 (1): 49–62. doi:10.1002/jmor.20075. PMID 22965565. Sanger, E. B. (1881). "On a molar tooth of Zeuglodon from the Tertiary beds on the Murray River near Wellington, S.A." Proceedings of the Linnean Society of New South Wales. 1 (5): 298–300. Archived from the original on 2016-03-06. Lay summary. Tinker, Spencer Wilkie (1988). Whales of the World. Brill Archive. ISBN 9780935848472. Uhen, Mark D. (2002). "Basilosaurids". In Perrin, William F.; Würsig, Bernd; Thewissen, J. G. M. Encyclopedia of Marine Mammals. Academic Press. pp. 79–81. ISBN 978-0-12-551340-1. Uhen, Mark D. (2004). "Form, Function, and Anatomy of Dorudon Atrox (Mammalia, Cetacea): An Archaeocete from the Middle to Late Eocene of Egypt". Papers on Paleontology. 34. hdl:2027.42/41255. Uhen, M. D. (2005). "A new genus and species of archaeocete whale from Mississippi". Mississippi Geology. 43 (3): 157–172. Zalmout, I. S.; Mustafa, H. A.; Gingerich, P. D. (2000). "Priabonian Basilosaurus isis (Cetacea) from the Wadi Esh-Shallala Formation: first marine mammal from the Eocene of Jordan". Journal of Vertebrate Paleontology. 20 (1): 201–204. doi:10.1671/0272-4634(2000)020[0201:pbicft]2.0.co;2. OCLC 4908948040.
Zimmer, Carl (1998). At the Water's Edge: Macroevolution and the Transformation of Life. Free Press. ISBN 9780684834900. Wikimedia Commons has media related to Basilosaurus.